Located west of downtown Orlando, Winter Garden has been ranked as one of the fastest growing suburbs by forbes.com. Winter Garden is a quaint city just far enough from the hustle and bustle of Orlando, but close enough to enjoy its major attractions. Part of Orange County, Winter Garden is home to many of its own museums, parks, and dining establishments. Historic downtown Winter Garden offers an assortment of shops, restaurants, cafes, and museums to its residents, such as the Central Florida Railroad Museum and the Winter Garden Heritage Museum. Be sure to catch a play at Garden Theatre, Winter Garden’s performing arts venue or visit the Art Center or the Downtown Pavilion, where a Farmer’s Market takes place on Saturdays. If you’re looking for a day out in nature, explore some of the walking and cycling trails at Lake Apopka and Magnolia Park. What’s Near Our Winter Garden Apartments? Winter Garden’s proximity to Orlando and its ever-growing theme parks has helped to make it become an ideal spot for growth and a desirable place to live. Winter Garden apartment community, Slate Luxury Apartments, is located close to everything your heart desires.Just outside of Orlando with easy access to the Florida Turnpike and FL-429, we are minutes away from Valencia College, Fortis College, and within a short drive of the University of Central Florida. Not to mention major employers such as Lockheed Martin, Orlando Health, Florida Hospital, Seaworld, Walt Disney World, and Universal Studios. 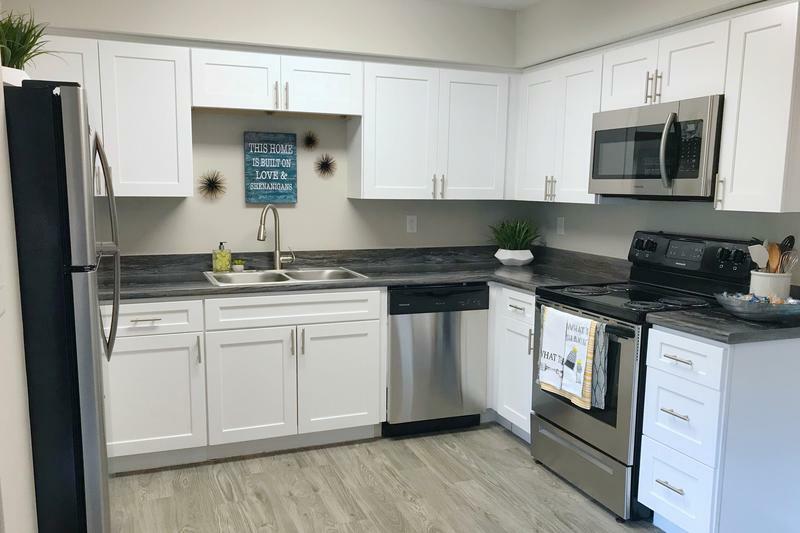 Our apartments for rent in Winter Garden, FL are within walking distance of Historic Downtown Winter Garden where you can enjoy the local dining, parks, boutiques, and shops. Live the lavish lifestyle at Slate Luxury Apartments. Enjoy the modern design of your new home with an open concept kitchen, white cabinetry, stainless steel appliances and granite-style countertops. All apartments have private entry, wood-style flooring, central AC and heat, as well as a patio or balcony. Get your pup ready because we’ve got an off-leash dog park with agility obstacles that we’re sure they’d love to play in! We love pets of all sizes and we even have pet events to prove it! But the pets aren’t the only ones living the high life. Residents of our apartments in Winter Garden can enjoy our resort-style pool or fitness center (coming soon). Explore your new home on our walking and jogging trails, or start a game of bocce in our bocce ball court. Need a little rest and relaxation? Find your favorite spot under one of our pergolas or one of our hammocks. Discover your new home and schedule a tour with us today!